1 of 3 Place mushroom caps, rounded-side up, on baking sheet and coat with nonstick spray. Flip over and spray again; sprinkle with salt and pepper. Bake at 375 degrees F for 15 minutes, turning once. 2 of 3 Cook sirloin, cut into 1/2-inch pieces, with butter for 2 minutes over medium-high heat. Add a dash of Worcestershire sauce. 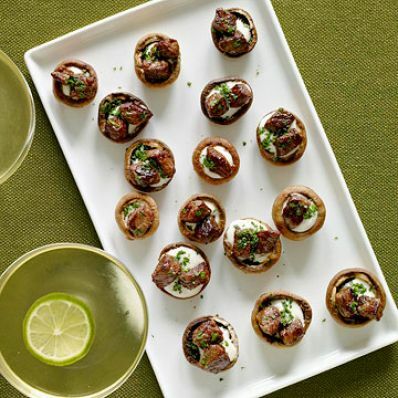 3 of 3 Spoon a dollop of creamy horseradish sauce into each mushroom cap and sprinkle with chopped parsley. Top with sirloin.